Finding a professional pet groomer you can feel comfortable leaving your precious fur babies with can be a challenging task, especially when you have anxious pets. The best pet groomers in Illinois are caring, patient, and experienced in providing high-quality grooming services. 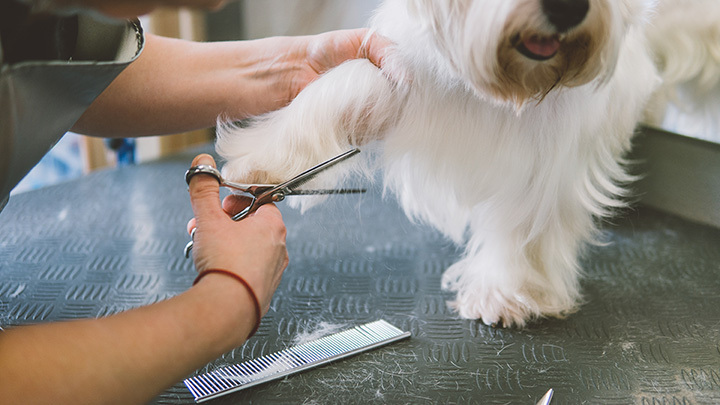 Recommended for their excellent service, check out the 10 best pet groomers in the state. Pets look and feel great after being groomed at Yuppie Puppy. Patrons appreciate the professionalism and consistently friendly service here. They handle all types of dogs, and their care for pets is evident in their high-quality work and attention to detail. Pets always leave here in a good mood! For a thorough pet grooming job at a reasonable price, look no further than Honeylane Pet Grooming. Customers love the short wait times, the staff’s patience with anxious pets, and friendly atmosphere. Whether you have a cat or dog, Honeylane is a place you and trust for your pet grooming needs. If you’re looking for a safe environment with caring staff, head to Pampered Pet. They offer a variety of services including baths, haircuts, boarding, daycare, and more. Customers claim their pets look forward to coming here and always leave happy and tired. This grooming facility is very accommodating to their customers’ needs, as well. Doggie Stylez shows a genuine interest in their client’s pets by providing a comfortable environment for pampering. Their full groom includes haircut, bath and blowout, glands, nails, and more. They also brush your pet’s teeth for a little extra. Their daycare is also a great choice for pets. If you want your pet meticulously clean, head to Bark-A-Lounge Pet Salon. The owners really care about the pets that come through their doors and try their best to accommodate pets with allergies or special needs. They do get booked full, so be sure to schedule your appointment a few days in advance. Pets actually get excited to get groomed by this full-service pet parlor. Huckleberry’s Pet Parlor provides a professional grooming experience by staff who love and care about pets. This grooming facility also offers a self-wash option for pet owners who want to wash their pets on-site themselves. The pet daycare here is also very recommended by locals. Spiffy Pets always puts their customers first and strive to provide the best grooming experience for all pets. Their caring staff pamper pets in a calm atmosphere, leaving even the most anxious pets feeling relaxed while being groomed. Spiffy Pets is a groomer you can trust with your precious fur babies. Kara is a reputable pet groomer known for her professionalism and care for pets. She offers convenient hours and always makes sure pets feel safe, comfortable, and happy in her care. Her prices are also very reasonable and she even gives the pets hair bows and bandanas. Cristy’s Pet Grooming strives to make everyone and every pet feel welcome. The staff members treat the pets as if they were their own and make sure customers are completely satisfied. Pets love getting groomed here and their owners love the affordable prices. Jagger’s makes every effort to ensure your pets are comfortable and relaxed. They pamper your pets in a stress-free environment, leaving them looking and smelling great. Jagger’s also features a daycare, which is open seven days per week, boarding, obedience training, and a self-serve dog wash. It’s one of the best grooming facilities in Southern Illinois.